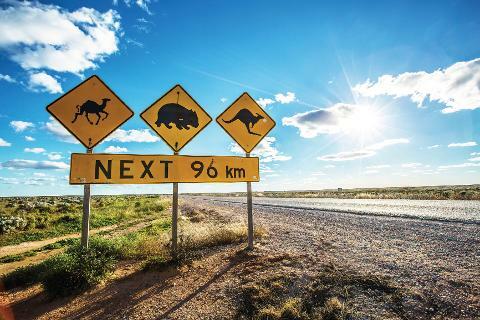 This 9 day, 4000km journey across the South West of Western Australia and South Australia and will leave you breathless, fascinated and reconnected with nature in a way you could not have imagined. This journey has it all. 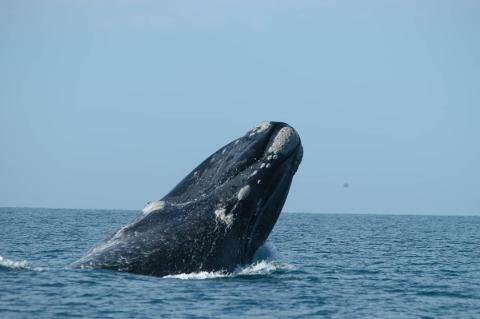 Stunning and diverse scenery, once in a lifetime wildlife encounters, food and wine experiences and indigenous culture. 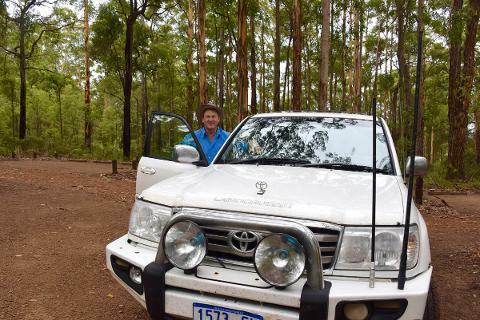 Travelling in an executive 4WD with your local guide you will get off the beaten track and experience The Real Australia. 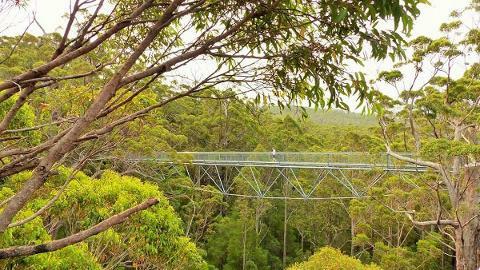 way around the Margaret River region, walk through the treetops in the Valley of the Giants and be amazed at the squeaky white sandy beaches of Esperance and Cape Le Grand. 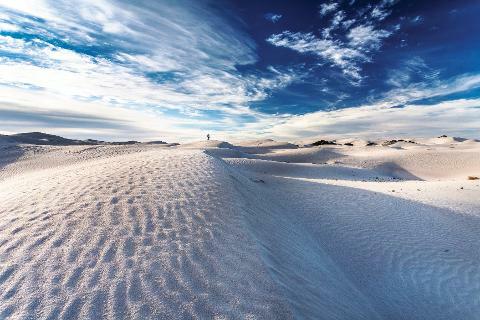 Travel the longest continuous cliff line in the Southern Hemisphere and feast on the delicious seafood of the Eyre Peninsula. Create life long memories experiencing indigenous cultural, whale watching, swimming with sea lions or shark cage diving, 4WD’ing off the beaten track along the sand dunes and coastal tracks and do some incredible bush walks. You’ll take to the ocean experiencing various cruises and have the opportunity to do a to scenic flight over the Great Australian Bight. And at the end of the day you can relax and reflect enjoying local wines and delicious food. This once in a lifetime journey has something for everyone and the best thing is you’ll have all of these incredible places to yourself giving you a chance to breath deep and take it all in. You will be picked up from your Perth accommodation bright and early where your expert local guide will spend some time with you and a huge map showing you what is in store for the next 9 days. Then your journey will begin with the first stop about 2 hours south of Perth at the popular holiday town of Busselton. Here you will walk along the world’s longest jetty followed by a visit to the first of many breathtaking beaches. After lunch you’ll enjoy one of the best indigenous experiences in Australia at Koomal Dreaming. Journey into Ngilgi Cave where you’ll be mesmerised by a live didgeridoo performance, storytelling and traditional fire-making. region. 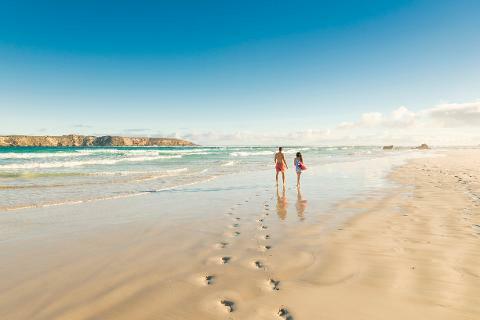 Margaret River is also known for its world class surf beaches and we’ll show you the best at the Margaret River mouth. 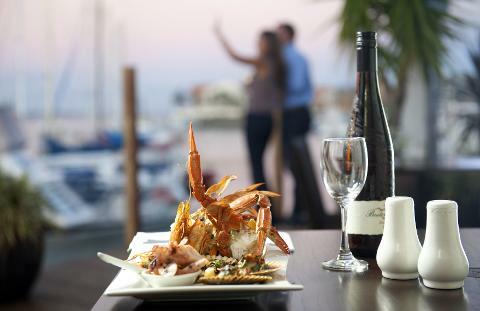 Tonight we’ll enjoy dinner at the iconic Margaret River Hotel before settling into your accommodation. Today we’ll travel 280km and stay at the Darby Park Apartments in the heart of town. 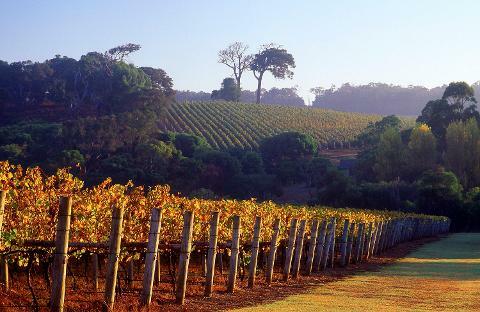 We’ll leave Margaret River bright and early to explore the stunning sights of the South West of Western Australia. 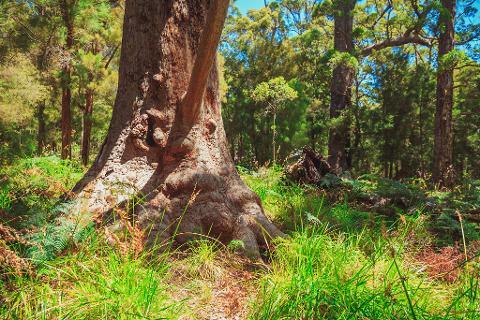 First stop is the old growth forests of the Valley of the Giants in Denmark where we’ll walk among the ancient tingle forests and if you are feeling brave you can climb the 51m Diamond Tree. From Denmark after lunch we’ll journey towards the rugged coastlines and rock formations of Albany getting into town just before dinner. Today we’ll travel 350km and accommodation will be at your self-contained apartment in the lovely seaside town of Albany. After your continental breakfast, we’ll have a look around Albany, taking in the views of the bay from the Mt Clarence lookout. If you are lucky to be travelling during wildflower season the region will look even more picture perfect. The landscapes will change as we head towards Esperance but not before we stop out the simply mind-blowing Twilight Cove. You’ll be introduced to the spectacular scenery of this regions with its white sandy beaches and crystal blue waters but this is just a taste of what’s to come tomorrow. 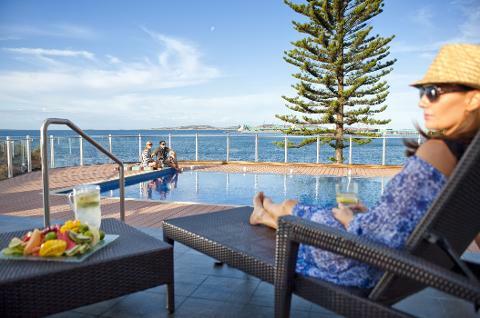 Today we’ll travel 480km and spend two nights at the Esperance Bay of Isles Motel. features blindingly white sandy beaches, an ocean coloured all imaginable shades of blue and sand so fine it squeaks between your toes. 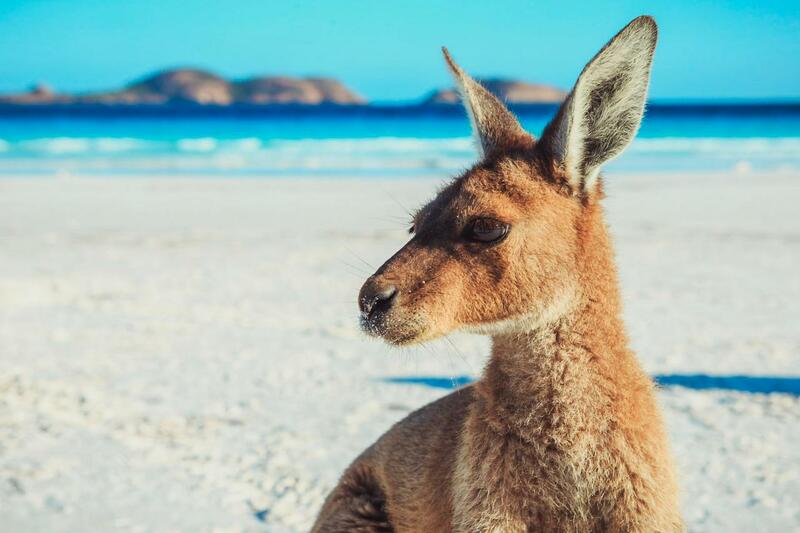 Wildlife is in abundance including the iconic beach sunbathing kangaroos which are usually up for a photo opportunity. 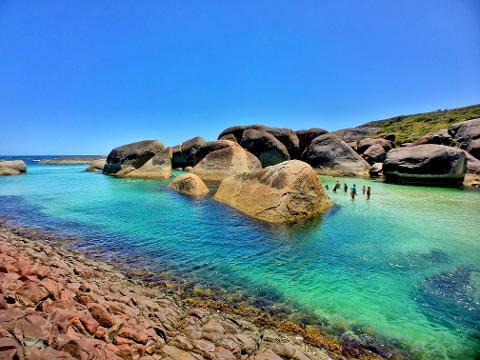 Swim, bushwalk and reconnect with nature today and tonight we’ll stay back in Esperance just travelling 100km. Today starts before the birds chirp as because we are crossing from Western Australia into South Australia today we are putting our clocks forward 1.5 hours. Today we have a lot of land to cover as we embark on Australia’s greatest road journey, crossing the Nullarbor Plain. Our guide will entertain you as you enjoy the changing landscape as we travel towards the South Australian border. We’ll go off-road, 4WD’ing along the Balladonia Track with a highlight exploring the old Deralinya Homestead. This property was built in the 1890’s as a sheep station and abandoned in 1926. This is a great place to realise just how resilient our pioneers were when they opened up outback Australia. Today we travel a fairly long distance even by Australian standards, of 920km. Tonight we have the unique experience of staying in an iconic Outback Roadhouse Motel in Boarder Village, just a few kilometres from South Australia. Today we continue our journey along the Nullarbor stopping at the iconic Koonalda Homestead and Eucla Telegraph Station. You’ll even have the opportunity to play golf on the longest gold course in the world, the Nullarbor Links. The Great Australian Bight is the longest continuous cliff coast line in the Southern Hemisphere. 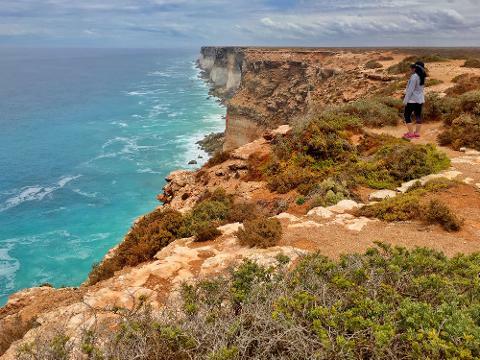 You will be blown away by the scenery of the magnificent Head of Bight, Australia’s ultimate coastal lookout. 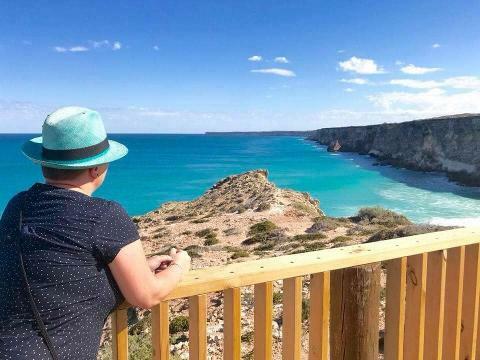 In the months of July to September you’ll be able to see hundreds of Southern Right Whales and their young taking shelter in the Great Australian Bight Marine Park. You’ll also been given the option to do a scenic flight over the Head of Bight and Nullarbor during these months. Today we travel 480km and overnight in Ceduna at Shelly Beach Caravan Park 5 Star Villa’s. 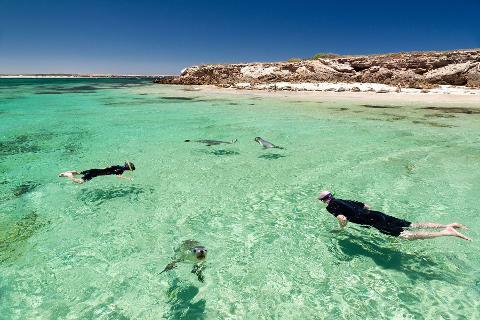 This morning we’ll made our way to Baird’s Bay where you’ll have Optional Experience and once in a lifetime opportunity to swim with Australian sea lions and dolphins on a 3-hour cruise of the calm waters of the Eyre Peninsula. The puppy dogs of the sea will splash, twist and twirl all around you and the magical dolphins won’t disappoint either. out on a Nocturnal Wildlife & Stargazing Tour giving you a chance to see the beautiful southern skies and get up close and personal with native wildlife while it’s at its most active. If you are travelling between June to August the sea lions will not be operating in which case we will tailor make your perfect day for you. 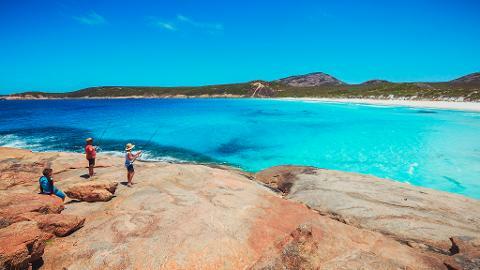 Choose from 4WD’ing, beach fishing, bush walking, visiting National Parks or simply relaxing. 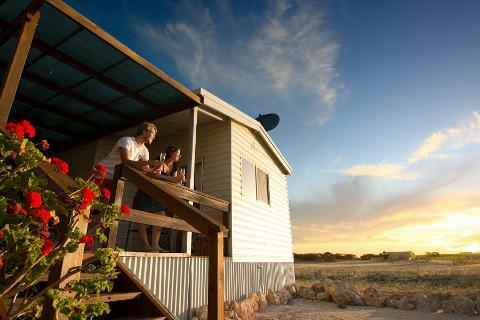 Today we’ll travel just 170km and tonight you’ll sleep in a fully self-contained cottage at our property Coodlie Park. 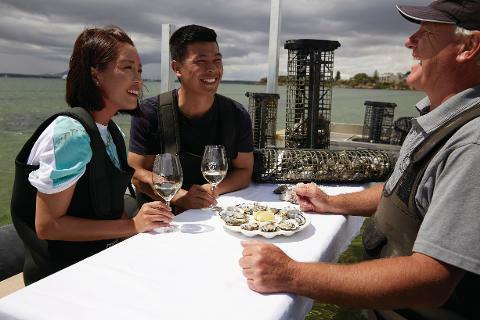 After a home cooked breakfast we’ll travel to the picture-perfect seaside town of Coffin Bay and put the wadders on to learn about the Oyster Industry on the Eyre Peninsula, while feasting on the fresh pacific oysters you have collected yourself straight out of the ocean. As we head down up the west coast towards Port Lincoln we’ll explore the regions pristine National Parks and some other beautiful coastal sights such as Locks Well and Talia Caves. As we arrive into Port Lincoln we’ll board the Electric Boat Tesla Marina cruise. This is followed by a tantalising dinner of local seafood harvest at an award-winning seafood restaurant. Today we travel 230km and have our last night of the tour at the award winning Port Lincoln Hotel. Today you have two quite different experience to choose from! 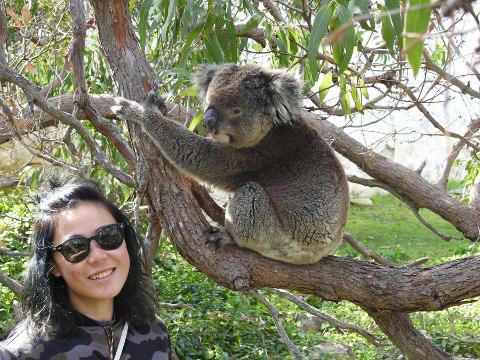 South Australia that feature magnificent views of rugged and raw coastline and also a popular wildlife encounter of a cute and cuddly kind at Mikkira Station, home of the Eyre Peninsula koalas. each has a slightly differently approach. You’ll find more information about this optional experience here. to Adelaide. 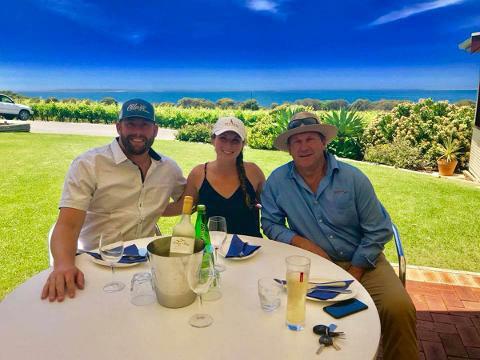 Your all-inclusive tour also includes your transfer from Adelaide airport to your pre-booked accommodation where you’ll spend time reminiscing about your once in a lifetime journey across Australia. While everything on our tours is included in the price such as transport, accommodation, food and entry and national park fees, there are some optional extra experiences not included in the price that you can choose to do. Get a whole new perspective of this incredible landscape taking a 45-minute scenic flight over the Head of the Great Australian Bight while you spot hundreds of Southern Right Whales and their young playing in the waters below. This is an amazing experience and really two experiences rolled into one! 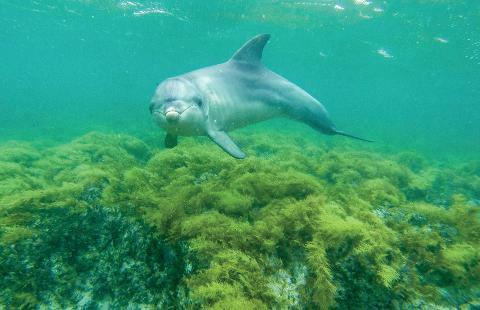 You many have swum with dolphins before but the interaction you will have with the sea lions and dolphins together at Baird Bay is once in a lifetime and truly life enhancing. The rare and endangered Australia Sea Lions are the puppy dogs of the sea splashing, jumping, twisting, and twirling all around you and if you’re lucky you might even get a kiss. The magical bottle nose dolphins won’t disappoint either! check out all the details here and this experience also needs to be booked in advance. Calypso Star Charters was established in 1990 and have a proud history of providing safe and exciting Advanced Eco Certified Shark Cage Diving. They are also the only one-day Shark Cage Diving operator who is permitted to use natural fish berley (chum) to attract the sharks. This sustainable practice provides passengers with the best possible chance of sighting and interaction close to the vessel and cage which will enhance your incredible experience! The full days charter boards at 6.30am and it takes about 2.5 hours to get out to the Neptune Islands. If you choose to jump in the cage it’s an extra $100 paid on board and no diver experience is required. All food and equipment is supplied and MV Calypso Star 2 is the only Shark Cage Diving vessel fitted with a Gyroscopic Stabilizer greatly increasing guests’ comfort throughout the day. 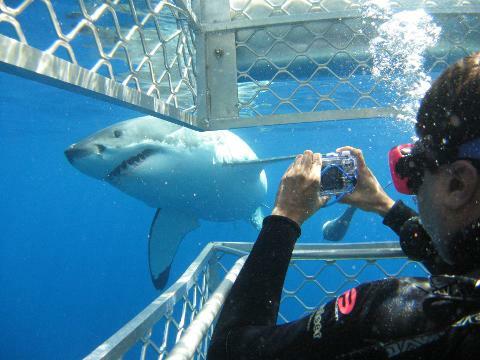 Alternatively jump on board with Adventure Bay Charters on this full day tour out to the Neptune Islands which gives people the opportunity to shark cage and they also offer the world’s first Shark Aqua Sub, a revolutionary new way to view Great White Sharks in their natural habitat whilst staying dry! Watch the sharks from a glass viewing area with 360-degree views underwater. This company is also Advanced Eco Certified and instead of chumming, use rock music to attract the sharks! The tour departs at 6.30am and includes breakfast, morning tea, lunch and afternoon tea and returns around 6.30pm. Flights are operated by Rex and depart Port Lincoln in the evening depending if you do shark cage diving or stay on dry land.